It's starting to get kind of Terminatoresque over here. First my bank account then the MobileMe and now the New York City MTA. A while ago, in the name of cost cutting, the MTA automated a number of their stations. Then, slowly and quietly they made some stations financially automated but with a station agent available for information and emergencies. Both of the stations I use on work days are like that. It means that if you want to buy a metrocard to get on the train you need to use a machine. There is a human being in the station but that person has no way to sell you a metrocard directly, all they can do is teach you how to use the machine. Now, there's a cash option and an ATM/Credit option but it's still all automated. I hadn't thought about one particular eventuality and it seems that the MTA hadn't either. Today all the ATM/Credit options citywide went down. It's a computer network, right? It's no big surprise that it might go down completely, right? Guess who has no back up option? So today I rode for free both to and from work but I was charged for two separate one month metrocards because I attempted purchase twice. Still waiting to see how that pans out. 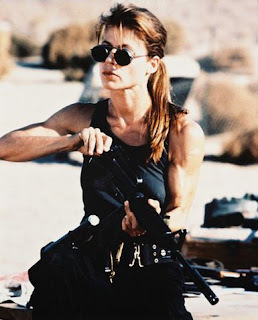 Where's Linda Hamilton when you need her? Backup, schmackup ... those are for entities that care about their customers. They're a dying breed! She is busy doing pull ups in jail. Or was it a mental institution? I am think of the right movie, right? Dying Julia or long since dead? Auntie, yes, right movie, it was a mental institution. For the criminally insane, of course, but still.